Leanplum, a mobile marketing platform and Segment partner, released a new data science report, “Personalize or Bust: The Impact on App Engagement.” We analyzed 1.5 billion push notifications. The big finding? Personalization increases open rates by up to 800 percent! That’s pretty huge. Personalization, we found, improved nearly all aspects of the funnel. According to the analysis, push notifications triggered by individual user behaviors produce nine times the open rate of blasts sent immediately. But first, let’s backtrack a little. Here’s how we got that data. We looked at 1.5 billion push notifications, sent from apps to users around the world. These included massive apps with millions of Monthly Active Users (MAU) and smaller apps still building steam. Data covered the course of January 2015 to March 2016, or about 455 days. With this, we wanted to determine why users returned to an app, the time spanin which they re-engaged, and how message relevance affected opens. In other words, how does personalization impact app engagement? 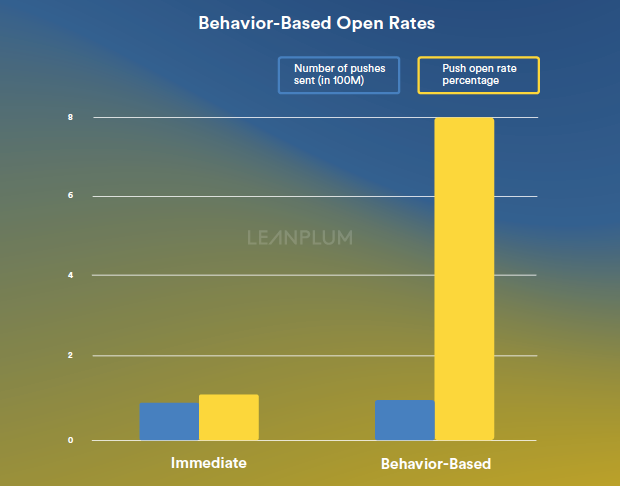 For this blog post, we’ll zoom in on the effect of push notification delivery typeon open rates. To learn more about Android versus iOS, personalization content, or location, check out the full report. Let’s begin by breaking down delivery types. There are five ways app managers can push notifications to their users. Scheduled Blast: Send messages to selected users at a predetermined future time. Scheduled by Time Zone: Program messages to arrive at the same time in every user’s local time zone. For instance, every user would receive the message at 8pm their time. Optimal Time: Use a machine learning algorithm that analyzes individual app usage patterns to automatically send messages at a time in the day when users are most likely to open. To keep it simple, let’s parse out how these delivery types perform in sections. First, let’s review how push notifications scheduled to go out at a future time compare to one another. Below, we’ve laid out the engagement rates for messages sent via scheduled blast, scheduled by time zone, and Optimal Time. The takeaway: Optimal Time sees the highest success rates. Optimal Time accounts for users’ individual engagement patterns, sending push notifications when users are prone to open the app. The intelligence of the algorithm contributes to much higher open rates. In another report, we learned that users around the world engage with push notifications at different times of day. Even if marketers schedule by time zone, sending at 8pm for example may result in great open rates in North America. But due to cultural differences, users in other regions might prefer to engage earlier in the day. While some brands may think that localizing by time zone is sufficient, data shows that users respond to even greater levels of personalization. Every person is unique. Apps must leverage tools that recognize and respond to individual engagement patterns. Next, let’s look at how behavior-based deliveries. What are behavior-based deliveries, exactly? Behavior-based deliveries are messages sent in response to user actions. Here, we’ve laid out three sample push notifications sent via behavior-based deliveries. You can see that a travel app may message a frequent flier about hotel deals in response to a booked flight. 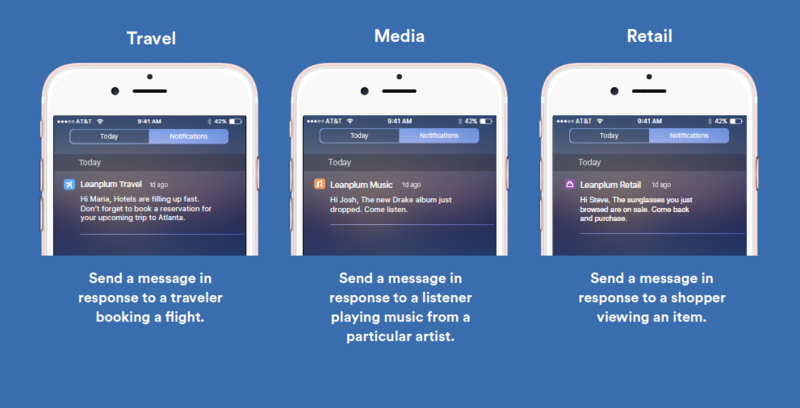 A music app may send a listener an alert that the artist they recently listened to released a new album. A retail app may send a shopper a notification that the item they viewed last week is now on sale. 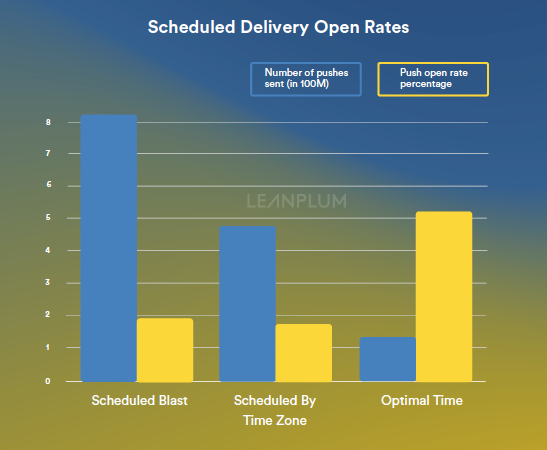 Here’s how behavior-based deliveries perform side-by-side with immediate sends. The takeaway: of the five delivery types, brands were less likely to send messages via immediate and behavior-based methods. Both of these categories had under 100MM pushes sent. Yet behavior-based notifications, triggered by unique user actions, saw astounding engagement. In fact, behavior-based push results in open rates 800 percent higher than immediate blasts. Personalizing a message based on individual actions garners much more engagement. Starting a one-on-one conversation that recognizes and responds to individual behaviors is invaluable in mobile marketing. After all, mobile is the most personal device people own. Your communications should reflect that. To get access to the full report, download “Personalize or Bust” today. If your team is looking for a mobile marketing solution, Segment makes it easy to set up Leanplum. Leanplum combines industry-leading solutions for Messaging, Automation, App Editing, Personalization, A/B Testing, and Analytics. We’d love to chat about how we can help you reach your mobile goals. With Segment, you’ll be able to get started in a jif.